“I’m really pleased to have got the ride on him. 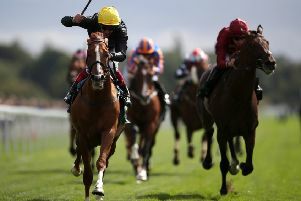 I won the Victoria Cup, so I know him well – he’s a horse that just takes a bit of knowing,’’ Turner told Sky Sports Racing. “The big field will suit him, the lack of rain will probably help as well. He has won on soft ground, but it’s a mile. “I was a little bit disappointed with him at Wolverhampton in the Lincoln Trial after he’d run so well there before,’’ said the Upper Lambourn handler. “I think when they’re racing quite tight in big fields on the all-weather he’s not the biggest horse and he probably got a little intimated and the race got a bit rough for him. Charlie Appleby’s colt has been off the track since his Epsom success, with a leg injury bringing a premature end to his campaign last July. Masar has been training in Dubai since January, and Appleby reports plenty of positive progress – although the Godolphin team are in no hurry to map out any plans. The Newmarket trainer said: “He is in good shape and is stepping up each week out there (in Dubai). He will start cantering at the end of this week. He has done everything right, what we’ve asked of him. He still remains very exciting going forward.